Delicious nutty cookies great for Halloween dinner party. Halloween is next week, and my kiddos are very excited about it. This year their demands are high, and they want particular costumes. My daughter selected the costumes for herself and her brother. The little guy is okay with that. Until this year I would dress up both of them with some Indian dresses and clothes I bought during my India trip. I can’t do that anymore. They have become choosy now; also want to go for trick treat. I told them they can go around the neighborhood but no more than that. Every Halloween I try to make some goodies also. This time I made these Owl cookies. I got this recipe from a magazine in my kids’ swimming school. While they are swimming, I will flip through the magazines and if I find something interesting, I will ask the girls in the front desk to copy it for me. They are very nice; they will do that for me. I like this recipe because it is a short bread cookie one with no eggs and frosting and only almond meal in it. Recipe called for M&M’S and I bought it from Wal-Mart but they turned out to be too big for the eyes of the Owl. When I tried to bake with them, eyes are falling off while baking. So used Skittles instead, and that turned out to perfect. I used the recipe, however changed the entire procedure. 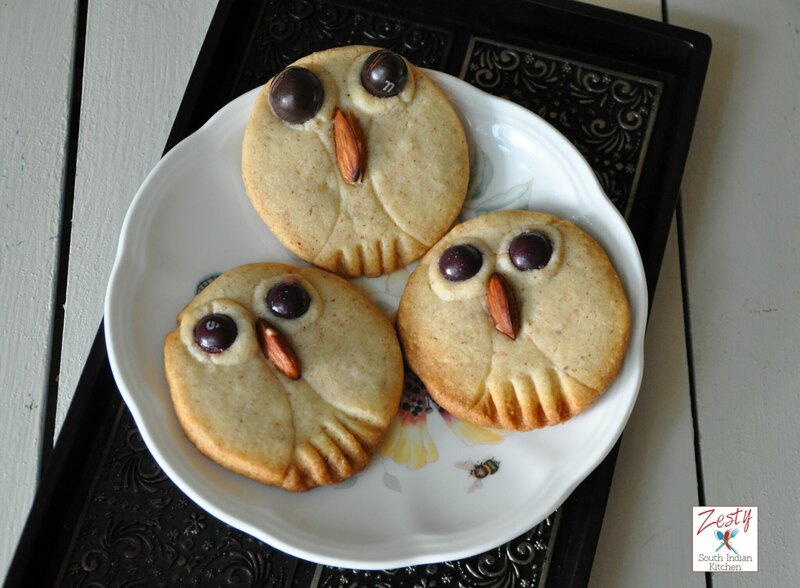 You can make these delicious owl cookies with flour, butter, almond meal and sugar. You don’t need any special device to make only a 2 ½ inch round cookie cutter. Cookies are nutty buttery melt in mouth and looks cute, but you need a little practice in cutting the wings, if you cut too deep then it became pieces and if you shallow cut them it will disappear while baking, still I need to improve on that part. My daughter was excited to stick skittles as eyes and halved almond as beak. Give it a try you will love it. Here comes the recipe. I have one more Halloween themed recipe is coming in next week. 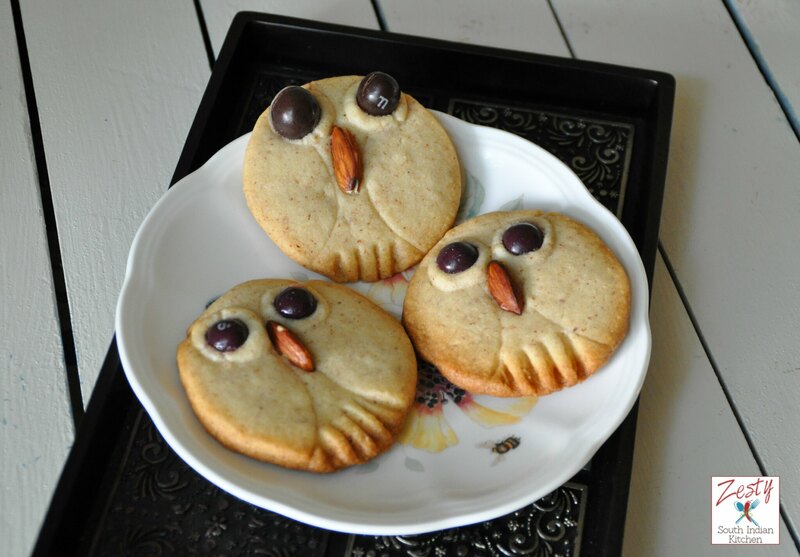 Delicious nutty owl cookies which is egg free too great for Halloween dinner party. In a food processor or grinder add ½ cup whole almond and 1 tablespoon of confectioner’s sugar and grind them into fine powder. Adding sugar while grinding the almond will prevent it becomes almond butter soon. In a medium bowl add sugar, flour, salt and almond meal and mix well and set aside. In a kitchen aid mixer attached with paddle attachment, add butter and vanilla and almond extract and beat well so that it gets combined well. To this add the flour almond mixture and just combine to form dough. Divide the dough it into two flat discs and refrigerate for at least 2 hours or overnight. I did overnight refrigeration. When you ready to 20 minutes before baking remove one disc of dough from refrigerator, preheat oven to 350F. Using 2 ½ inch cookies cutter cut of the rounds and places it in baking sheet lined with parchment paper.
. Which will makes wings of the owls. Make sure to cut deep at the same time not to cut completely. I need to improve that part little more. Place 1/8 teaspoon of dough on each sides for eyes. You can use ¼ teaspoon dough on each side if you want big eyes. Place halved almond in the center for beak. Slightly press in brown skittle/ M&M on the dough for eyes. Using fork make impression at the bottom part of the cookie to make wing. Bake the cookies for about 15 minutes or until sides become golden brown. If the dough becomes soft refrigerate another hour until it become easy to handle. 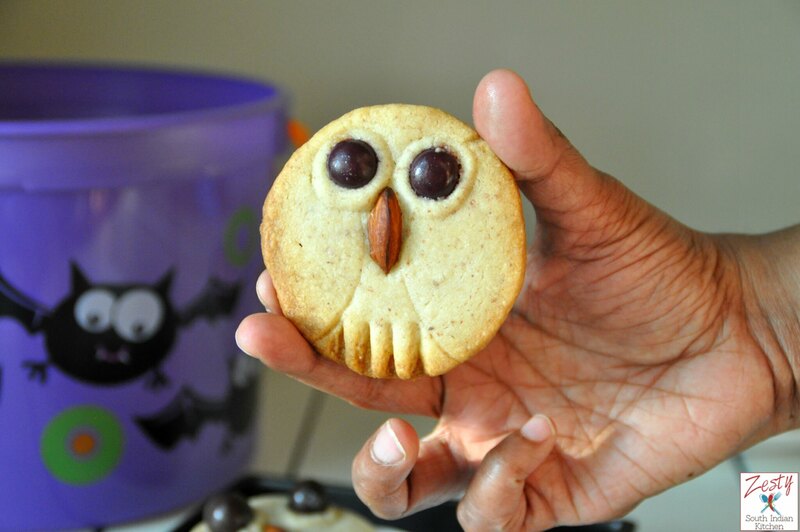 The owl cookies look so cute Swathi, kids would go crazy over it..
Thats owls are so cute.Recipe seems to very easy too. I always miss coming to your blog… I see the post on fb and then I think I will blog hop later…but that later never happens…infact I always wanted to ask, is there a way I could get your feeds in my blogger? Perfectly made owl cookies, the details are perfect..
Awwwww, these owl cookies look absolutely adorable — beautifully crafted. Perfect treat for the kids. 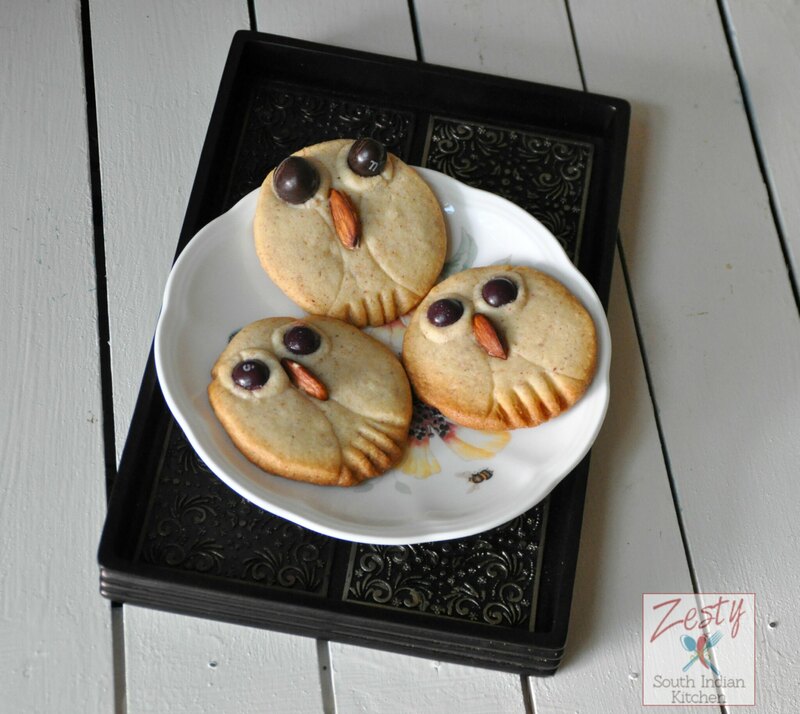 Perfectly made owl cookies, love the idea of putting M&M for eyes, I did these last year inspired from Madhavi’s cyberspace. Yours looks cute! These are the cutest thing and a perfect Halloween treat! Pinning !